Previous installments in this series posed the question and examined potential components of an answer: first, long-term trend in GDP and labor demand and supply curves, next, cultural influences. It is time to put it all together and analyze quantitatively the relative contributions, if any, of the three factors. What I will do now is called the stepwise analysis: I will build the model in a series of steps, adding a single explanatory variable in each step. This approach allows us to understand whether any of the explanatory factors are necessary to explain the dynamics of the response variable (which is, in our case, the real wage from 1927 to 2012). We will also be able to see which features of the data each explanatory variable helps us to understand. What we see is that the growth of GDP per capita explains why real wages in 2012 are higher than in 1927, but not much of anything else. Over the last 85 years GDP per capita grew fairly steadily, although sometimes at a faster, and at other times at a slower rate. There is not a hint of a break in the GDP curve during the late 1970s, when the real wage abruptly shifted from the fast growth regime into that of stagnation and decline. Why did the growth rate of real wages outpace that of GDP per capita before 1970s? 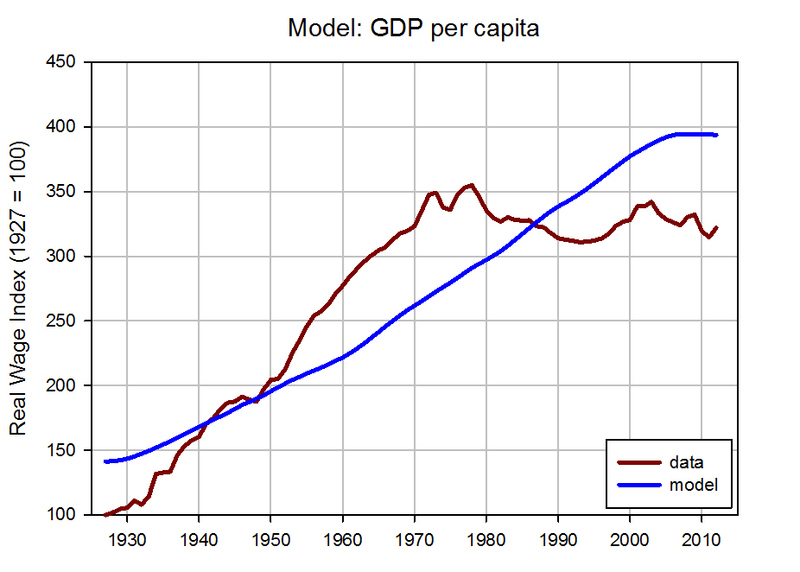 Why did the growth rate of GDP per capita outpace that of real wages after the 1970s? We need to look to other factors for possible explanations. Statistical analysis says that this model explains data substantially better than the model with just GDP. The predicted curve hints that demand/supply ratio may be responsible for some of the trend reversals in the data, but overall, the model is not particularly satisfactory. Adding this variable results in a dramatic improvement of the model-generated trajectory. But we are not done yet. 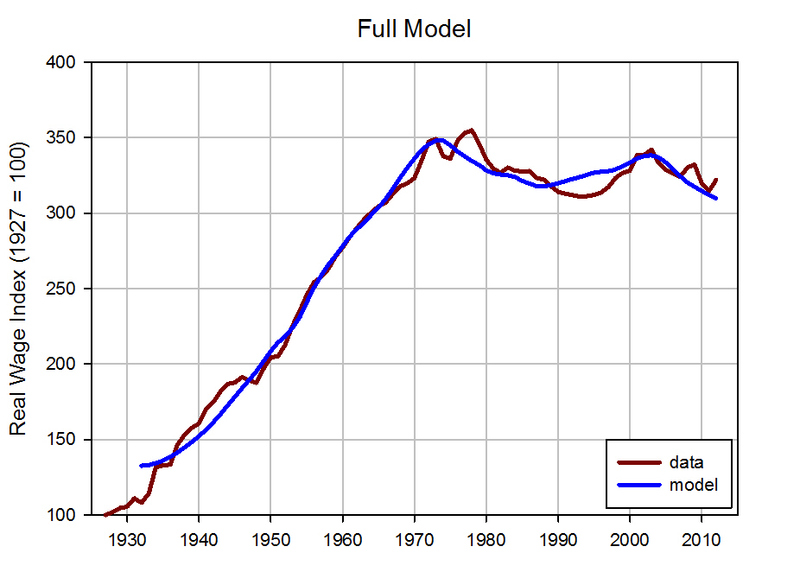 Notice that the break point in the model curve, when it shifts from the growth to the stagnation regime, occurs several years before the break point in the data. As I discussed in a previous installment, this is precisely the expected pattern. As economic conditions change (for example, supply begins to overtake demand for labor), wages do not adjust to the new situation immediately. Contracts need to run their course and be renegotiated, and both employers and employees don’t yet know whether this year’s conditions are part of the long trend, or just a temporary spike. This means that real wage this year actually reflects the social and economic conjuncture that obtained several years ago. 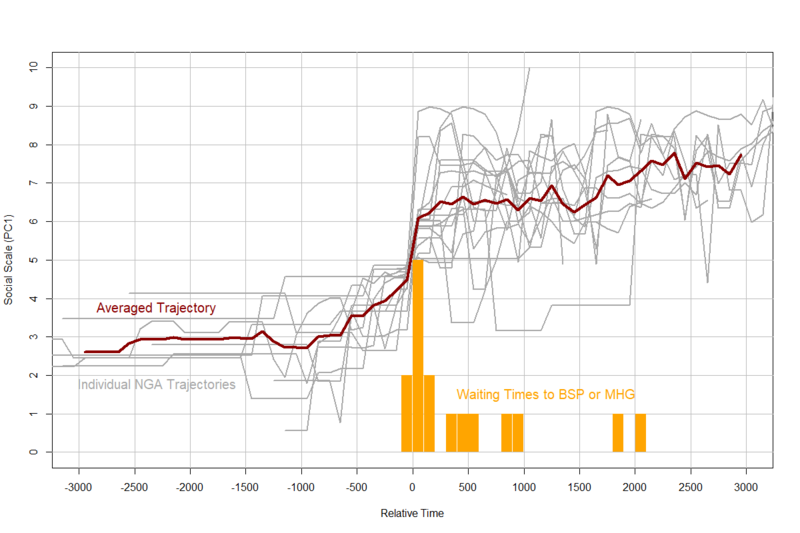 We now see that the model now accurately predicts the break point, which is not surprising, because I introduced the delay parameter to account for this feature. What is surprising is that the model now predicts the wage dynamics during the stagnation phase: down during the 1980s, up until the early 2000s, and then down again. Such fine-scale correspondence between the model trajectory and data is entirely unexpected, and serves to further strengthen our confidence in the ability of the model to capture the forces driving the dynamics of real wages. Additional exploration of various combinations of explanatory variables confirms that all three components are needed to replicate the data pattern. The conclusion is that real wages grow faster, or slower than “per capita income” (GDP per capita) due to an interplay between market forces (captured by the labor demand/supply ratio) and cultural influences (proxied by the real minimum wage). What’s new here is the use of the real minimum wage as a proxy for ‘cultural’ forces (remember, that this is my shorthand notation for such non-market factors as social norms and values, political and legislative landscape, and the balance of power between employers and employees). As far as I know, nobody has attempted to include ‘culture’ in a quantitative analysis of forces affecting real wages. But once we do so, we find that culture is of paramount importance (quantitatively, its effect is greater than that of the demand/supply ratio). It would be desirable to do two other things. First, the model is very simple, which is definitely a virtue. It folds a number of factors that have been discussed by economists and reporters (immigration, trade deficit, labor productivity, etc.) 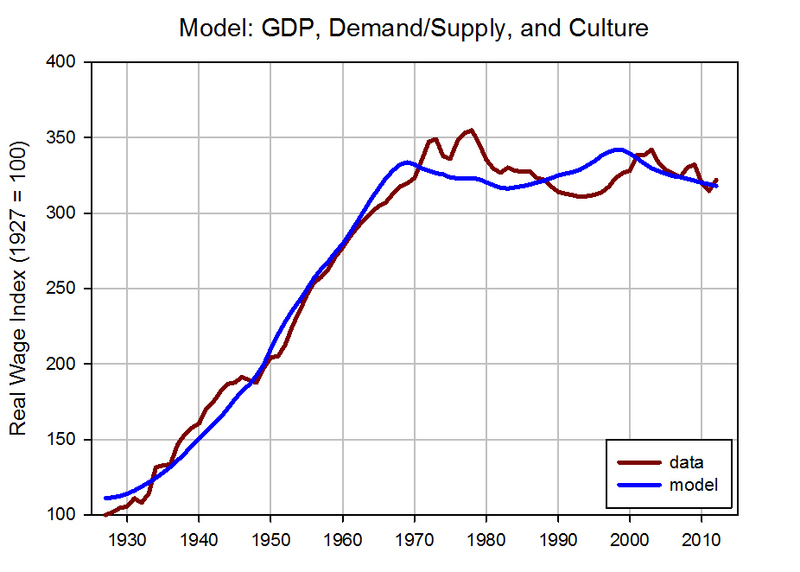 into a single measure, demand/supply ratio (and similarly with the cultural influences). I need to ‘unpack’ this aspect of the model so that we can weigh the relative contributions of such factors to the overall outcome (whether wages grow or stagnate). This looks like a good topic for the next blog. Second, the model does not incorporate (at least explicitly) the effect of technological evolution. Some of it is folded into the growth of the GDP, which I take as given, but it would be extremely interesting to look at its effect as a separate explanatory variable. Does anybody know of a good proxy for this very important factor? where W is the real wage, G/N is GDP per capita, D/S is the labor demand/supply ratio, and C is the real minimum wage; τ is the time lag. The predictor variables were smoothed by kernel regression with bandwidth = 4 y (the response variable, naturally, is not smoothed). “The stable economic structure allowed a stable division of the pie. Workers (much more heavily unionized then than now) got steady raises and stable jobs. The government got a stable flow of tax revenues. Shareholders got reasonably steady dividends. There are more posts around this idea, but this is a good starting point. This is similar to the dynamic I describe in my Aeon article. 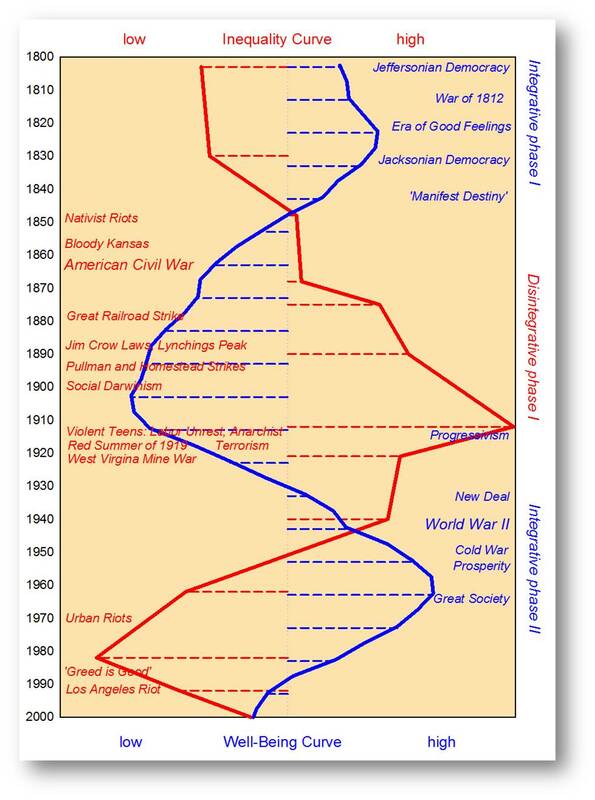 What Mead calls the “blue model” is the socio-economic regime that obtained during the New Deal–Great Society period. Then the trend was broken by the ‘Reagan revolution’. Why? 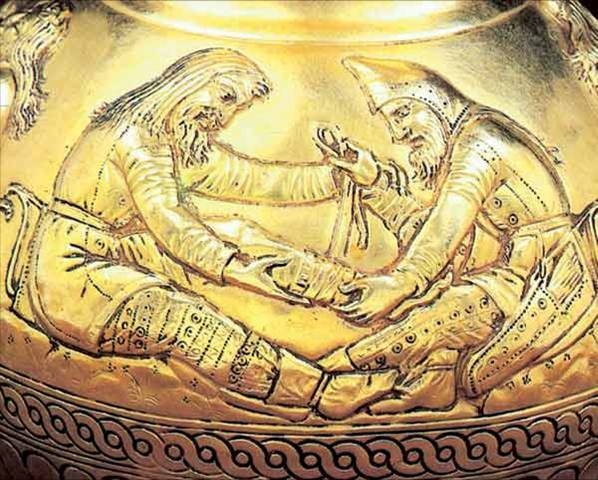 Does Mead have an explanation? The the socio-economic regime that obtained during the New Deal–Great Society period was great IF you were a white male; otherwise not so much. I’m not so sure. After all, it seems that the greatest progress for racial and gender equality arose from that era. We cannot just take the status of groups (such as they are) as being due solely to a set of policies in a given era. We also have to look at the starting point. And the starting point circa 1932 for women and, in the United States, African-Americans, was none too healthy. Looked upon in this light, the relative levels of socio-economic equality that obtained during the New Deal — in Europe, the post-war Social Democratic settlement — was highly advantageous for *previously* discriminated groups. Now, it is true that corporations, or more precisely, their owners, did not benefit from lessening of inequality between white males and other workers, but this is because those other workers’ income was being raised up rather than white males being revised down. And that was due to levels of labour organisation — *including that of black and female workers* — and therefore their bargaining power. It is entirely possible to conceive of alternatives to the neo-liberal reforms of the 1970s, which put an end to labour’s rising share of the social product (i.e. including the ‘social wage’: free healthcare, education etc). Russell Mead’s explanation doesn’t explain very much because he doesn’t address why the anti-labour reforms were implemented rather than pro-labour reforms (e.g. state credit to worker co-ops, repeal of Taft-Hartley etc). Such an explanation would, of course, touch upon the forbidden heresy of the class struggle. There is no reason why we should not have both: a decline in ‘categorical’ inequality (discrimination against women and minorities) and a decline in ‘quantitative’ inequality (the gap in incomes and wealth). 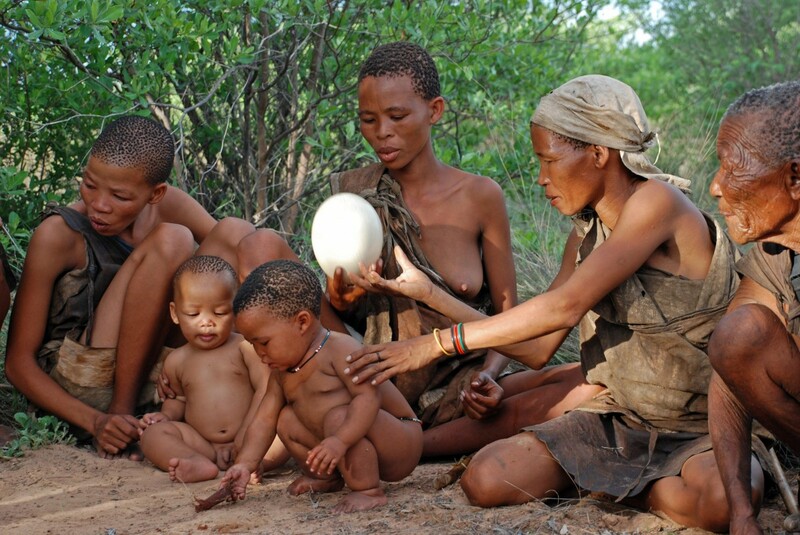 Obviously in the case of women it was a zero sum proposition for families. Two people work and no rise in living standards. If they had stayed out of the workforce then wages would have been higher and the family would have had the same standard of living, but with an entire spouse devoted to the home as well. Neat! The conventional measure of technology is labor productivity, real output per hour worked. 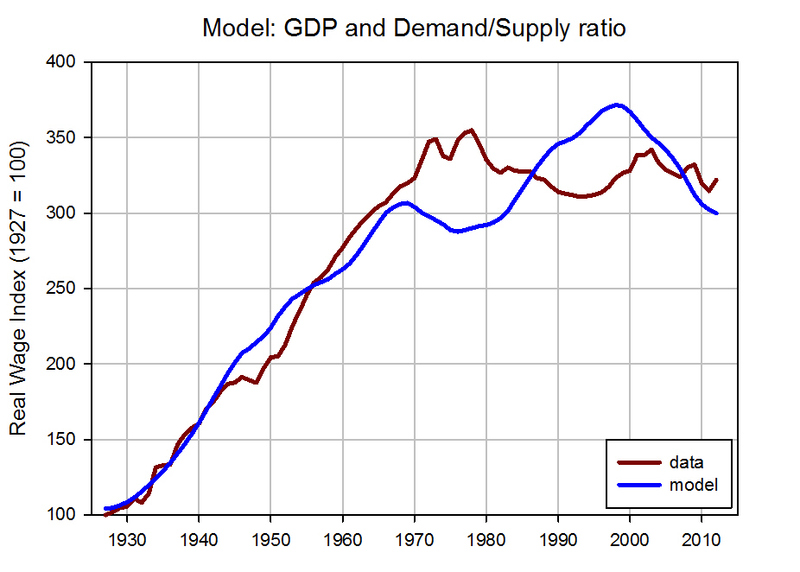 In that case, my model incorporates it already: as a short-term effect, it decreases demand for labor, and as a long-term effect which increases GDP (although how precisely this happens, I don’t think economists know). The first effect I calculate explicitly, the second implicitly by using the actual GDP series. But I am looking for a proxy that would reflect the postulated shift to ‘knowledge-based technology’. As the hypothesis goes, because economy becomes more knowledged based, only highly educated workers are needed, and demand for unskilled workers decreases. Hopefully you won’t leave us hanging and will advance some ideas on a suitable proxy in the not too distant future. The changing ratio of high school graduates to undergraduates to postgraduates over the time period might serve. The introduction of ‘cultural forces’ seems eerily reminiscent of what used to be known as the ‘class struggle’. This ‘suspense’ is not by design – I am honestly stumped right now as to the appropriate proxy for ‘technology’ (automation, computerization). I am currently reading David Autor and colleagues articles looking for ideas (that is, when I find time to spare from teaching etc). The ‘class struggle’ component is quite real. 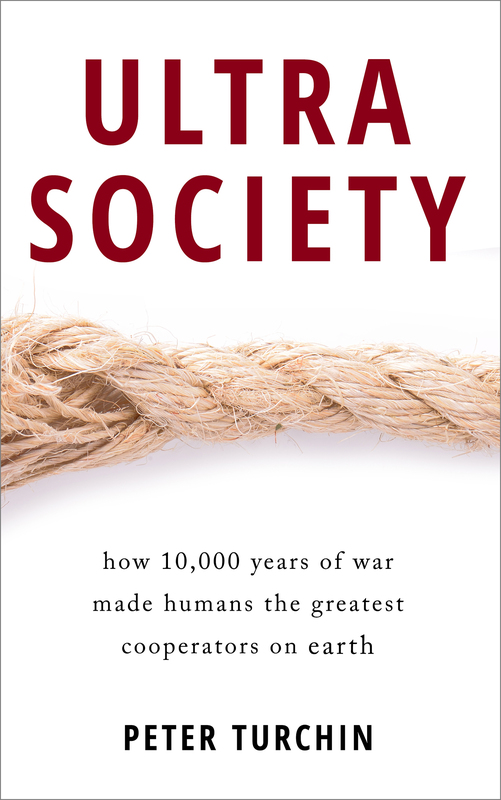 The latest version of structural-demographic theory integrates Malthus, Marx, and Weber. Roughly speaking, the ideas of these three social thinkers correspond to the three main components of the theory: popular well-being (or its inverse, immiseration), the structural relations between the elites and commoners, and the role of the state. Mead says: “The old system slowed innovation”. But the data say otherwise. The productivity of American workers grew twice as fast in 1950-1973 compared to 1974-1996. I finished reading “American Challenges: The Blue Model Breaks Down” by Walter Russell Mead. I find his analysis shallow and unconvincing. For my alternative explanation of what happened in the 1970s, see my series, of which this blog is one, and the Aeon article. Have you tried running the model in first (log) differences? I ask because both real wages and per capita incomes are non-stationary time series which can create a spurious correlation and pollute the estimates of the effects of other variables (regardless whether the D/S variable and the minimum wage are themselves stationary). Since there probably is a direct relationship between per capita income and wages, the model should survive that tweak more or less unscathed though some of the parameter estimates might be a bit different. Also, I think your D/S variable is essentially the employment rate, scaled by an “average hours” constant, which goes into the “A” when logged. Yes, I have experimented with the first difference in log real wages as the response variable. But doing so screws up the interpretation of the model (you are basically dividing the RHS by W). A better way to deal with autocorrelations and potential nonstationarities is to fit a regression model that includes ARMA terms for the residuals. I have now done so. Adding ARIMA (1,0,1) terms results in residuals that are both stationary and free of autocorrelations (as judged by ACF and PACF). The conventional measure of technological change is change in output per unit of all inputs, also known as “total factor productivity” or TFP. This is not a directly observed variable, but by default assumed to be the residual in growth accounting regressions. That is, when economists count all the inputs (capital investment, labour, investment in education, etc.) in the production process, the error term (also known as the Solow residual) is posited to contain the synergistic effect of all the inputs working in non-additive ways to increase overall efficiency with which inputs are converted into GDP. In essence, TFP is the degree to which measured GDP exceeds the sum of its measured & measurable inputs. There is A VAST LITERATURE ON THIS SUBJECT, almost the entire long-term growth literature is devoted to it, and economists have estimated TFP for most countries. Paul Krugman first became notorious in popular circles for arguing back in 1994 that East Asia’s growth miracle was not predicated on TFP growth ( http://econ.sciences-po.fr/sites/default/files/file/myth_of_asias-miracle.pdf ) but the underlying data (Young, etc.) have been subsequently undermined. Reagan was a response, not a cause. Be useful to do the same exercise for Australia, since we have a much higher rate of migration, but a much more selective and controlled migration system. (Migrants to Australia actually raise the average level of human capital, for example).